How do I change a Pinterest board cover photo? Been getting into Pinterest — thanks for all your great Pinterest help — and now I want to fine tune things. I have a ton of Pinboards, and want to change the image that shows as the largest “cover” image. Is this possible, or does it just automatically show the latest image added to the board? That’s a good question and it’s a feature that the Pinterest team just added. What’s interesting about it, though, is that it works just fine in some browsers and in other Web browsers it never finishes the update and you’re stuck having to wonder why they can’t code things properly. But I’ll get to that in a bit. As you know, Pinterest is a shared photo and image site where your images are organized into pinboards, as if it’s a huge set of bulletin boards and you have a lot of prints and thumbtacks. Just without the poked thumbs and space constraints of the physical world. The difference is that like Google Plus and Facebook image libraries, Pinterest boards have their own aggregate “thumbnail” view, so that you can view all of a Pinterest user’s pinboards simultaneously. In that situation, what image is largest? That’s the “board cover” and you can indeed change it. 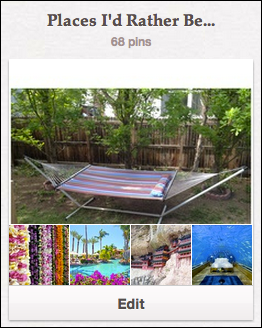 The “68 pins” means that there are 68 images on this particular board, and we can see five: four little thumbnails and the larger image of my hammock (yup, it’s sitting in my backyard). 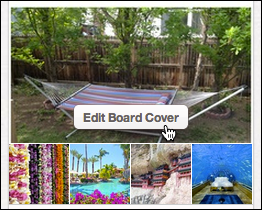 Problem is, the hammock isn’t the best image to convey what I’m thinking about with my “Places I’d Rather Be…” board, it’s just the latest pinned. Use the left and right arrows to find the image that you think best represents this particular pinboard. Once you do, notice that the image isn’t necessarily the right proportions for the cover image, so you’ll see edges that are “outside” the viewing area. If you look closely above, you can see that the hammock photo is a bit too tall so there’s a bit that’s above and below the visible viewport. That’s more like it with my “Places I’d Rather Be…” board! Once you’re ready, click on “Set Cover” and if you’re in the right browser it’ll switch almost instantly. If you’re not, well, it’ll never succeed and you need to try again with a different Web browser. So which browsers work? Safari and MS Internet Explorer both work just fine, but if you’re a Google Chrome fan as I am, you’ll wonder what’s broken when it responds to the “Set Cover” button but never actually completes its task. No indication of what’s broken, but just know if you want to fine-tune your Pinterest boards you’ll need to pop into IE or Safari to get it to work. So, that was how I USED to do it, but that “Edit Board Cover” doesn’t show up for me anymore. Does it still show up for anyone else? A 4th for the question above! Looks like the Google search on this issue continues. . .
Ditto Heather and Louise, I have the exact same burning question. Help! I have the exact same question as Heather! I have some boards that I set the cover for previously, but now want to have them just auto-update with the latest thing pinned, but they don’t. Now I have to manually change the cover every single time I add something new. Any way to change it back to the default behavior? Has anyone found a solution for the issude that the “Edit Board Cover” doesn’t show up for me anymore? I set some of my board covers with pictures and now I’ve decided I’d rather show the latest thing pinned in that board. How do you get the board cover to go back to automatically showing the latest thing pinned? Is it possible cause I can’t figure it out!